Switch is proving to be incredibly popular with developers, as you'll know if you keenly track each week's eShop download update. There's no shortage of new software for Nintendo's system, and the latest annual survey from the Game Developers Conference confirms what is perhaps obvious now: devs love the machine. 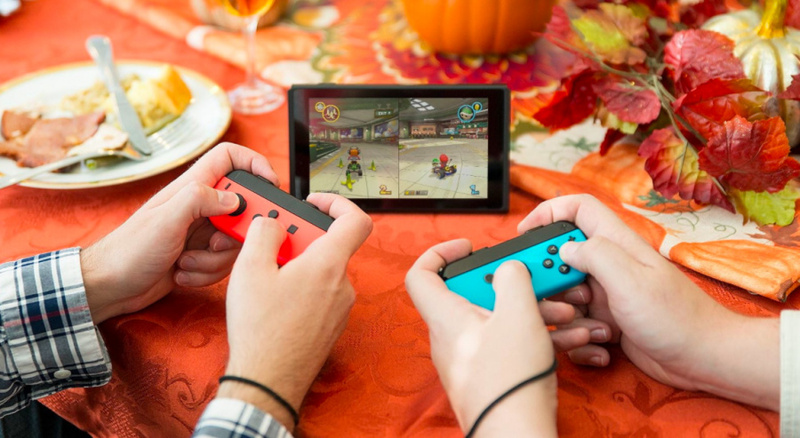 Almost 4,000 developers were polled, of which 36 percent listed Switch as the platform they are most interested in creating content for. The Xbox One only managed 28 percent, but Switch is still trailing behind PS4 (39 percent) and PC (59 percent). It's also interesting to note that 28 percent of developers said their games sell better on Switch than on other consoles, while 23 percent said they sold about the same amount. When you consider the larger market share both Microsoft and Sony currently enjoy, that's impressive. Elsewhere, roughly 12 percent of developers say they’re currently developing games for Switch (it was just 3 percent last year) and 15 percent say they plan to release their next game on the console. The same question got a 5 percent positive response last year. Other findings which aren't Nintendo-related include the news that VR's appeal appears to be on the wane (29 percent said VR/AR isn't sustainable, up 4 percent on last year's survey) and that mobile's influence is slipping a little; 32 percent of respondents said their game is headed to mobile, but that figure was 3 percent more 12 months ago. Great news, hope more 3rd party games get announced soon. Expected to see VR falling but very surprised to see mobile also on the decline. There's a graph, I'll post it in a minute. I would say the majority of those interested are Indie and smart phone developers. It's all good that 36% say they're "interested" in developing for the Switch. Actions speak louder than words, I've heard that line so many times before. Back it up. And for those interested in VR. Isn't it funny that more developers will develop for a platform that they know something about? It is great to see a good percentage of devs interested in the Switch though! VR is pretty cool, but in the end I think AR will be the tech that continues into the future. It's less isolating and seems that big companies like Apple are pursuing it. Thanks for the graph @SLIGEACH_EIRE always helpful to see the data presented visually. Not bad, though you don't mention how many developers said their games so better on other platforms than Switch. @SLIGEACH_EIRE Ouch, beaten by vr headsets. Xbox one is completely a Big joke. @Robotron2084 Which isn't much more than the number saying that they want to develop for the WiiU now. Poor WiiU, never got the love that it's games should have brought it. So ... a game in development for PC, with a port to e.g. PS4 being handled by a different entity or a port being planned after the development finished, would still be listed only under PC? It's just seems off to me, that 60% of devs have something in the works for PC, but only 30% have something in the works for PS4, when in fact, a pretty huge margin of games these days is being ported over - at least at some point or another. How does the sample of developers attending GDC compare to the population? Maybe smaller indie developers are overrepresented? I don't assume this data has been weighted in any way? I don't see why the XBO should be a big joke. Nice to see all those interested developers but I am not really interested in all those indie games. I want Harvest Moon and Animal Crossing. @Robotron2084 It's kinda hard to seperate them, but I'd have to agree with saying that it has one of my favourite libraries, but the console itself was unfortunately flawed due to the tech at the time, in my opinion. That said it's stilled hooked up to the TV as the go-to Smash machine. @Anti-Matter a joke how? 28% of developers are planning to develop for Xbox nearly twice as many as Switch. VR was never anything more than a gimmick and a fad IMHO, there's not enough mainstream appeal. Things which suit the hard-core and casual player-base a like are bound to come out tops hence the Switch being so versatile. Wii and DS? Who the heck develops games for those anymore? 2. No FF XII The Zodiac Age, FF X/X-2 HD Remaster, KH 1.5+2.5 HD, World of Final Fantasy = No buy xbox one. 3. Around 75% xbox one games are Same with PS4 / PC (example: The Sims 4, Portal Knights, Overcooked, Earthlock, My Time at Portia, etc), so i will consider Switch or PS4 version than xbox one version. 4. Trivial but this is my matter of taste. I prefer Blue box of PS4 rather than Green box of xbox one. But, i like Clear box of Nintendo Switch games better than PS4 or xbox one box. 5. Consuming more Watts for Xbox one X. Not good for me. @Anti-Matter I don't understand. Did I mis read something. How is the Xbox one a complete joke? Read my 5 Reasons on above. Xbox is Almost NEVER be a Part of gaming in Indonesia. (Almost) Nobody ever talk about xbox games in my country Indonesia. They hear games sell as well as if not better on the Switch. For many indie developers, it is well worth their time to port their games over to the Switch, if not make some new games. Switch owners are hungry and eager to get their hands on things they either haven't tried before or eager to get their favorite 3rd party games in a portable format with a nice big 720p screen. Can you see how many games on PS4 & Xbox one that i'm looking for ? From that comparison, i will definetely choose PS4. Xbox One is NOT Worthy for me with just very Few games that suitable for me. That said, console wars are silly. Nothing is a joke, nothing is a fail...... I've started to block specific sites for the same toxic mentality as this. All this goes to show is that Switch is interesting to developers, almost as interesting as PS4 which is brilliant. They are two totally different systems, and that's a damn good thing. And sure, people need to back up their claims and actually get developing, but you still only can work on a Switch game after Nintendo accepts your game proposal and sends you a kit. Until then, you're really still just "interested" in working on Switch. @Anti-Matter stupid reason. It might be a joke to you but Xbox One is far from a joke in the market. 2) this is subjective, i dont care about these games. 3) and out of the 75% of games that are multiplatform games, how many of these games will come to the Switch do you think? at least Xbox is getting developers to make games for them. 5) okay really??? i mean are you really going to call the Xbox stupid in a general sense because it doesn't appeal to YOU only? How self centered are you to think that the Xbox is a joke of a console because it hasn't done enough to appeal to you? do you somehow think this planet revolves around you? Who cares if you dont buy an Xbox one X, in fact i would go so far as to say please DO NOT BUY ONE, Xbox fans dont need you on their team. 😂😂😂 Of course games sell better on Switch! Nintendo gamers are used to paying more than players that gets the game for another console or on PC. We know there’s not going to be a possibility to wait and buy it on sale (maybe you can get 20% off online) because stores are either selling the game for full price or they’re sold out. @Anti-Matter that doesn't make Xbox a joke. It just means it's not for you. I think all consoles and platforms are awesome cause each has something to offer other people. @Anti-Matter Same thinking than you on the green box. If @Anti-Matter thinks xbox is a joke that's his/her opinion. Does it matter so much what he/she thinks? So defensive. I got LESSER Suitable games from xbox one than PS4. That's NOT a good deal for me. If Xbox One has FULL Backward compatible, i will consider to play specific old xbox & xbox 360 games. Otherwise, that was a Big Joke for me. Useless features if Not Fully 100 % Compatible. Switch and PS4 has No Backward compatible, But Nintendo Switch has at least 16 suitable Switch games for me during year 2017, compared with PS4 i got only 9 so far. ONLY 9 PS4 games that Really Really suitable with me. And Three of my PS4 games are also on Switch lately. And during year 2018, i had registered another 2 Switch games on my Buy List while No PS4 games Exclusive so far that i can add for my Tenth PS4 games as Finale to Finish my searching for PS4 games. Because whenever i see Multiplatform games, i ALWAYS Choose Nintendo version as long the games are Same, Not watered down. Oh, don't forget about Infamous Red Ring of Death from Xbox 360. For me it was a Humiliation from Xbox 360. So Ridiculous, i didn't even consider as a good machine even there are a Fixed version. @Razzy 16% I think were saying that Switch sales were less than PS4/X1 counterparts. The other 30 something percent have games that are either Swotch exclusive or haven't released a game on Switch. Right!. Subjects like this I always say, "we will see what happens". 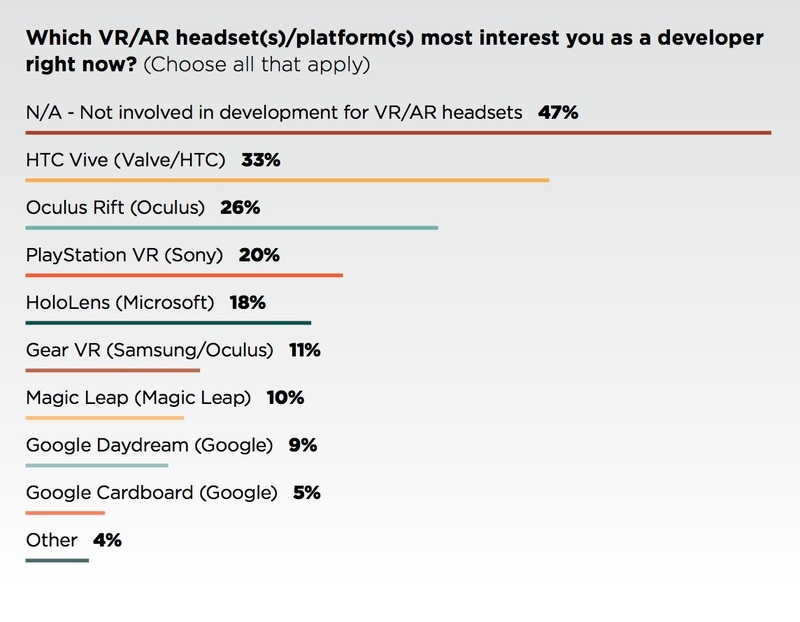 Surprised there is even 1% that said Wii U or Wii to develop games for. Weird. @Anti-Matter every single point you have made about the Xbox being bad is all subjective (down to opinion) if you think its bad that's good (or bad) for you. Personally i never had any issues with them, i don't own an Xbox one or PS4 because i live on a house boat and using a T.V is not very easy for me so i dont have one, all my gaming is portable. But if i did have a T.V i would own an Xbox One because quite frankly i think they are great and their new Game Pass looks very promising. > It's also interesting to note that 28 percent of developers said their games sell better on Switch than on other consoles, while 23 percent said they sold about the same amount. Does that imply 49 percent of devs said their games sell worse on Switch? Nope, not good enough, Nintendo is doomed. @Razer Saying anything is bad is almost always subjective. Glad to see growing interest in the Switch. @NinNin Well some idea's are truly bad and not just subjectively, like the Gizmondo or the Virtual Boy, the latter actually caused harm while the former caused a fair amount of financial damage as well as court cases. "Other findings which aren't Nintendo-related include the news that VR's appeal appears to be on the wane (29 percent said VR/AR isn't sustainable, up 4 percent on last year's survey)"
But virtual reality is the future and Nintendo is doomed for not hopping on the VR bandwagon, armirite??? I remember last year when certain members were doom and glooming over the responses. And I remember specifically saying "this will drastically change by the end of the first year". And here we are. @Phle As someone also living in Norway, I were usually able to games on older system for a reasonable price. Thou Switch games seems to stay expensive as of now. @Kohaku I didn't get a screen shot, but this morning I saw a tweet from someone asking the same thing and game's developer replied with a .gif saying "stay tuned". Never thought I'd see the day where a Nintendo platform was seeing this much developer interest. @tobibra I’ve had to pay full price for used games, Kid Icarus was almost impossible to get, but I managed to get a used version at full price at GameStop and the game was originally from another country, no store stocked Kid Icarus until recently. I’m glad I got it used, because I got it just after launch and if you get it now, I doubt you’ll get to enjoy the online mode that was actually really awesome. I’ve also paid a lot for specific Wii games. Xenoblade Chronicles was almost impossible to get even as used, I had to look for months. Wii U games might be on sale now, but they only have the crappy ones left in stock at least for the most part. Generally Nintendo physical game copies will hurt your wallet and waiting for a “sale” is very risky. But digital gets more and more common, so I guess a lot of people will go there instead of paying a fortune for a physical copy. @Anti-Matter Remember that even if YOU don't like the Xbox and it doesn't have much presence in Indonesia (understandable as it doesn't really have much presence anywhere outside the US and Europe! ), it's important that it exists and this culture of fanboyism is detrimental to the community. We should want ALL consoles to succeed because it means the industry is healthy. If Microsoft stops producing the Xbox (or Sony the Playstation brand or Nintendo the Switch), something has gone wrong in the industry that it can no longer support three competitors. And we ALL lose out because games will become even more samey and less risk taking than before. This is why it's important to be supportive of all three companies. You don't have to buy their products, but you have to understand that their competition is keeping the industry strong. @Phle It depends on what you count as full price, but I have no problem finding 3DS games for 350kr or less. Of course there are exceptions, Kid Icarus being one. Guess we had different experiences. My problem is more that stores don't stock the games I want at all. Not even able to preorder them for some reason. I don’t think anybody ever bought an Xbox One for the indies and the 1X is Xbox’s shift to being the most powerful console, which was the point of the original Xbox. In that case indies won’t take advantage of the box and it’s not portable so it’s not the best place for them. It would be like buying an elite PC to play Fez. It’s really meant for AAA/AA games and studio-funded “indies”. @tobibra I would count full price as everything above 400kr for DS/3DS games and 450kr for Swithch/Wii U/Wii games. @Phle You could use websites like CDON, Gamezone or spillsjappa. They tend to have 3DS games under 400, with some exceptions. I do agree Toystores overcharge thou. All indies, all ports. Proper third-party retail titles still go to PS4 and XboxOne.